Burhan Wani is largely credited with reviving the image of militancy in Indian-administered Kashmir. Born to a highly educated upper-class Kashmiri family, Wani is believed to have been driven to militancy at the age of 15, when he was beaten up by police along with his brother "for no reason". Wani was extremely active on social media and, unlike militants in the past, did not hide his identity. His video messages, which would often go viral in Kashmir, were on the topics of Indian injustice, and the need for young people to stand up to oppression. The policeman died after his car went into a river in the Jhelum area on Sunday. Police say the vehicle was pushed in by crowds but some accounts say it went into the water after the driver lost control in an attempt to avoid stone-throwing mobs. 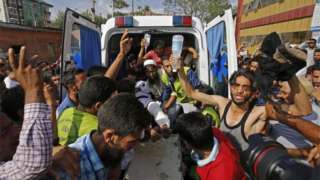 The BBC's Riyaz Masroor in Srinagar says tensions remained high on Monday, with crowds attempting to breach curfew orders. More than 2,000 pilgrims who were on the way back from the temple have been airlifted out of Kashmir, police officials told the BBC. Thousands attended Wani's funeral which was held in his hometown of Tral, about 40km (25 miles) south of Srinagar, on Saturday. Police stations and military installations were attacked in violent clashes afterwards, with several buildings burned down, police added.